Rotor-Lift has recently purchased two new state of the art simulators for its Advanced Training School. Both simulators are CASA approved for IFR (ab initio) & NVFR training with substantial flying credits available towards the respective ratings. More importantly both the Bell 206 & AS355 (SP-IFR) simulators have exceptional processing power to run the extensive graphics supplied by Microsoft. Both units provide the student with extensive realism for visual departures, approach and circling movements, including autorotations, unusual attitudes, single engine landings etc. At a fraction of the cost of training in a real multi engine IFR helicopter this level of realism in a simulator offers a significant boost to the student progress. It looks, feels and flies like a real helicopter! 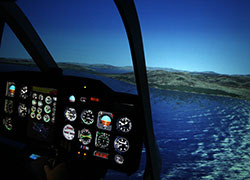 The cockpit of the AS355 simulator is a replica of our actual IFR helicopter and so there is a seamless transition made by the student, which translates into higher competency levels reached, at a lower east. All approaches can be taught, including RNAV (GNSS) from an Australia wide database. Cross hire of the simulators is available, with free training for your own instructors in the use of the simulator. The simulators can also be used for day/night VFR and NVG training. It is a valued training aid that can significantly reduce the cost of IFR training whilst lifting the student’s skill sets and procedural knowledge to a much higher standard.